Gamlake Destry Sallie was best bred and owned and Grand Champion. It was the aged cow from California that rose to the top of the field of 216 cattle shown in the 15th International Junior Holstein Show on Tuesday. According to judge Chris Hill, the homebred Gamlake Destry Sallie put all the pieces together for a championship. The Excellent-93 point cow sports an Excellent-96 point mammary system and has been a favorite of her owner Samantha Gambonini since birth. Following Sallie in the class as Reserve Champion was Lovhill Braxton Funky-ET. The cow from Owatonna, Minn., was exhibited by Joseph, Zach, Jerome, and Darian Stransky. When she was named Reserve Senior Champion, Judge Hill complimented her power through her front end. The pair of aged cows were followed by Intermediate Champion and first place fall yearling in milk, Lellavan Avalanche Fuji. She was exhibited by Brandon Almeida and the Borba (Frank and Diane Borba) grandchildren. There are two sets of siblings Frankie, Jax, and Harrison Borba and siblings Charlotte, Amelia, and Louis Borba of Central California. The Reserve Intermediate Champion was the winning Junior 3-year-old Butlerview Door Aleah exhibited by Christian Cunningham of Penngrove, Calif. 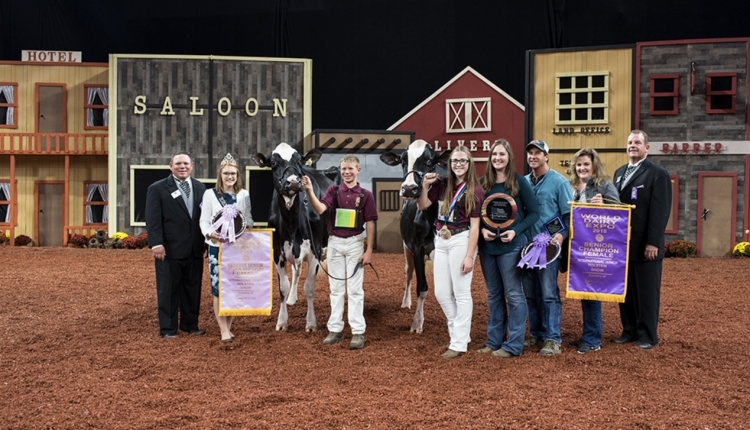 Junior Champion honors went to Kaelyn, Kenadee, and Keegan Weigel of Platteville, Wis. Their heifer Budjon-Abbott Alexandra-ET won the Winter Yearling class. Reserve Junior Champion honors went to Hatee Jacoby Paris, the second place Winter Yearling. She was exhibited by Alyson and Kenlee Philips of Lingleville, Texas. The champion bred and owned heifer was Savage-Leigh Lalas First-ET exhibited by Chase Savage of Union Bridge, Md.